Microsoft Exchange is a well-known mail, calendar, and groupware program that is used for businesses all around the world. Exchange allows administrators to achieve better productivity by simplifying tasks such as sending email messages, calendaring, providing delivery reports, archiving mail boxes, and more. Although Exchange has powerful tools for administrators to accomplish tasks, there are certain features that are not available. One missing feature is monitoring emails coming in and out of the Exchange Server. Mary is an administrator for her Exchange Server. Her Mail Server receives many emails from over two hundred users. She wants to check the flow of emails that are coming into her Mail Server. A possible solution might be for Mary to use the exchange message tracking to verify if the emails have left the exchange server or not. Unfortunately, this does not help much with her problem when she wants to see all emails that are coming in and out in real-time, since she would have to look up and check the logs. This method is inconvenient and time consuming. Mary can use the live monitoring feature in a software called Xeams to help solve her issue. Xeams is an additional email server that has many features such as live logs, spam filtering, and live monitoring. In order for Mary to use live monitoring, she has configured Xeams to sit in front of her Exchange Server. This way, every inbound email goes through Xeams before it is forwarded to her Exchange Server, and every outbound email goes through Xeams before it is delivered to the destination SMTP Server. This feature is accessed by going to the Tools menu in the Administrator's web console (in Xeams). Xeams' score of the email (based on filtering settings). Type of email based on the score (good, possible spam, spam). The type is displayed in an emoticon and with different colors (blue for good, gray for possible spam and red for spam). Each email coming in will be added to the live monitor screen almost instantly. This is very helpful to Mary (administrator) because she can easily check the flow of the emails in a convenient and secure way. Another important feature in Xeams is that emails are assigned a score. The score determines whether the email is spam or a good message. Scores can be configured by accessing the filter management menu. Live monitor is also helpful to administrators when they want to make sure emails are correctly scored and marked as spam. The Live Monitor is a very powerful tool that is unique to Xeams. With the help of this feature, administrators can verify that emails are coming in and out of their Exchange server with relative ease. Without this, it would be very difficult for administrators to check the flow of hundreds of emails that are coming in their exchange server and emails leaving the Exchange server to reach their destination. 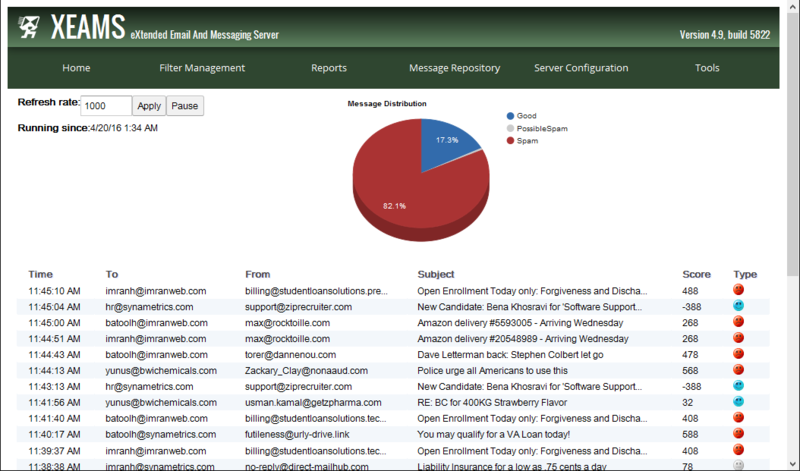 Xeams unique features provide solid solutions for email servers, including Exchange.